The way things are going right now, meat consumption is on the decline, and hopefully will continue to be. We’re not trying to tell you that going vegetarian or vegan is the best choice for you, but it has been proven that the meat industry has an incredibly negative effect on the environment and cutting down your meat intake may not be such a bad idea. Scientific America points out that it isn’t just the living conditions of the animals that we should be concerned about; it’s the production, processing, and distribution of the products that is ruining the world around us. Companies use pesticides, fertilizers, fuel, and toxic chemicals that get released into the water and air as well as the animals we’ll be eating. The animals themselves produce large amounts of methane, which absorbs heat in the atmosphere. And we neglected the amount of waste that this market produces. Households alone throw away almost 570,000 tons of food a year, which roughly equates to 50 million chickens, 1.5 million pigs, and 100,000 cattle. While we don’t want to tell our readers how or what to eat, we do believe that you should be conscious of how the industry treats its animals, customers, and the environment. So maybe skipping a hamburger once in a while isn’t so bad. If you do choose to do so, there are plenty of sites and articles out there to get you started in the right direction. It’s going to be a big change if you were raised on steak dinners, but making a change to our diets is one of the easiest ways we can help the environment get back on its feet and cut down on animal cruelty in the meat industry. Consuming less means that you’ll want to enjoy it more, so we’ve put together some information on dry aged beef and why it might be worth it to spend a little extra cash when you do go to get your weekly cut from the store. If you’ve never heard of dry aged beef before, we’re going to explain what it is and why it’s considered fancier than your usual New York strip. The steak you get in a restaurant is usually portioned large, fresh, and probably a bit overpriced. But there’s always the allure of getting to pick out your steak from a restaurant and most likely taking some home in a box. Let’s not forget that some restaurants such as Texas Roadhouse offer great deals on quite delicious food. And if you want a prime cut at the grocery store, you’re paying a bit more as well. If you know your meat basics, then you know that it’s all about that marbling – the better the marbling (referring to the visible fat content in the meat), the better the cut. But is there a steak better than the juicy, red ones you can find in the main meat case? If you genuinely enjoy the flavor of beef, then yes. Dry aged beef can be found in some butcher shops and chain stores such as Whole Foods Market. It may not look appealing, as it doesn’t have that great red color or juicy thickness to it. 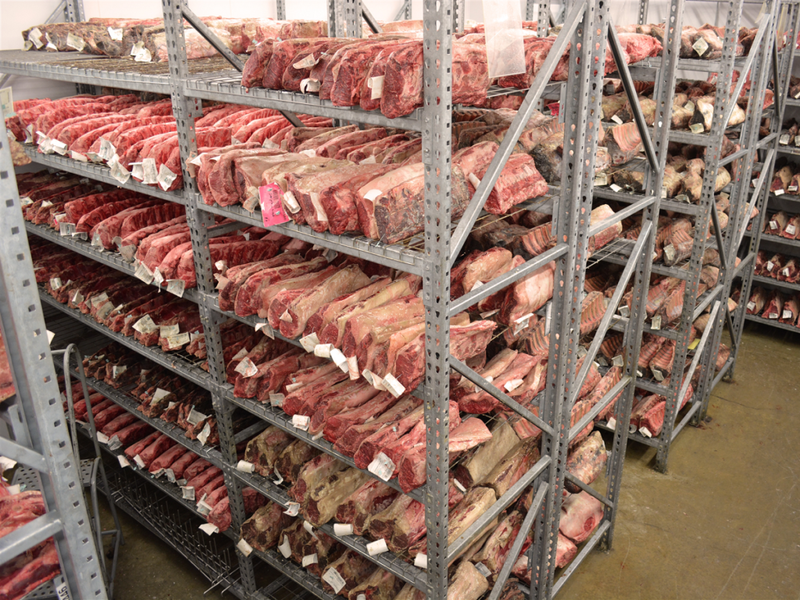 To dry age, a piece of meat means that it is kept in a carefully controlled environment for a set amount of time. This amount of time can vary, anywhere from a week to several months, but the general length of time beef is aged one month. During the process, moisture is slowly drawn out of the steak. This increases the flavor in the meat and excites enzymes into breaking down the meat a bit more, meaning that when you do eat it, it’s going to be very tender. The longer the aging process, the more flavorful and tender the cut of meat. If you do decide to cut down on your intake but still spend a bit of money on a good piece of meat, make sure that you’re using a dry aged cut on the same day. The temperature and environment of a refrigerator is off-putting for the steak. 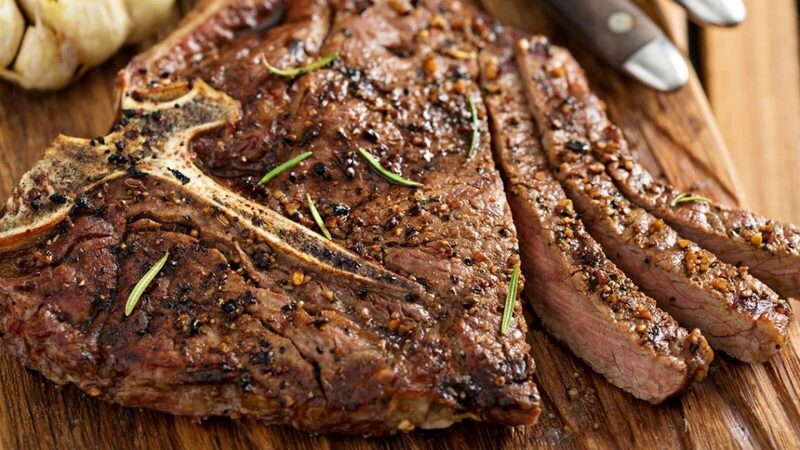 Like any other steak, dry aged can be either grilled or cooked in a skillet. Just make sure you’re letting it rest once it’s off the heat. You’ll find that dry aged steaks taste a bit buttery and cut like butter too – there are many times where a knife isn’t even necessary! Overall, dry aged beef tends to cost more and be harder to find because more time and effort is being put into it. 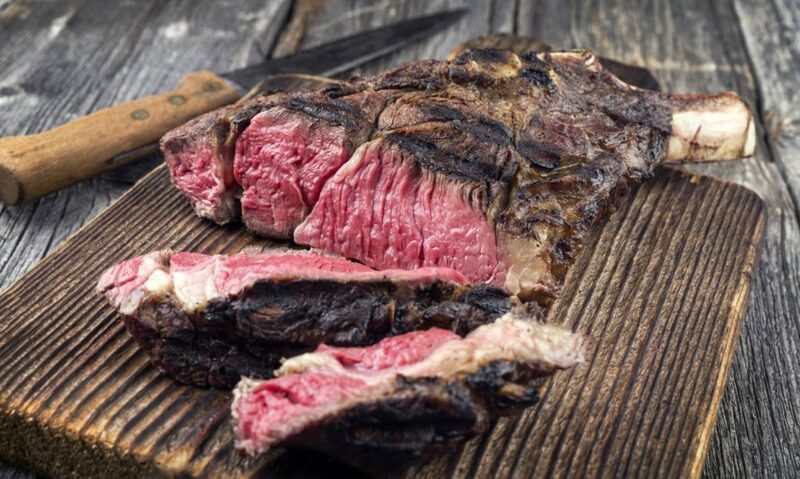 But whether you’re a meat connoisseur or someone who is deciding to cut down on their environmental impact by switching their diet up a bit, dry aged is an interesting experience. It might change how you perceive steak forever!